Adopted Rottweiler saves the life of Pregnant Woman from knife Attack !! Kasha Weston, was five months pregnant when some thugs knives broke into her house and started attacking her boyfriend and put a knife on her throat. It was Rocky, their adopted Rottweiler who saved their lifes and helped them. The couple was watching TV while the dog was asleep when suddenly, there was a loud banging on the front door. The dog, Rocky woke up and started barking madly toward the door. “I peered through the spy hole but I couldn’t see a thing but Rocky was still barking furiously.He wouldn’t calm down and we were worried he was going to wake the neighbours, so we put him in the bathroom.“ Kasha said. As soon as they put the dog to the bathroom they opened the door and 4 thugs with knives broke in asking for money, one of the thugs grabbed Kasha by her arm and dragged here to the kitchen while the other 3 thugs started attacking her boyfriend Aryan. Kasha told them she was pregnant, but they continued biting her boyfriend. “I thought they were going to kill us" she says. “But then Rocky crashed out the bathroom and came bounding over... He sprang to their defense and bared his teeth at the intruders. The intruders started running scared and Rocky was after them. Her boyfriend Aryan checked if she was OK and then ran after them too. She was worried about her boys, and followed them when saw Aryan and Rocky standing in front of one of the intruders. “He was staying, ‘I’m sorry,’ and Rocky was growling,” she said. They called the police and the police arrested the intruder. "Who knew what would have happened if he had not been there? Days later i though something was wrong.Over the next few days, he didn’t leave my side,” she said. "He’d even tenderly nudge my bump with his nose. It was as if he was telling the baby not to worry either.For the rest of my pregnancy, I couldn’t stop worrying about our baby.“I didn’t leave the flat unless Rocky was with me.” Kasha said. Now, that is a badass dog. Fantastic k-9. Rocky is the man (dog). Haha, for what do I have a Rottie? To put him into a bathroom? Well, my guy is with me, through good and bad times because Rottweilers are one of the rare breeds who are naturally team player with their human buddies. My guy is the perfect hunting companion, he rarely barks, but observes and can evaluate risks (hogs/boars and deers). 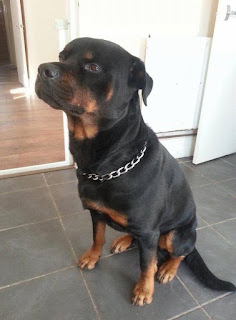 Bloody good Job - Rocky the Rottie!